For the past four years I have spent most of the spring, summer and fall playing and promoting the sport of Australian Rules Football with the Cincinnati Dockers. 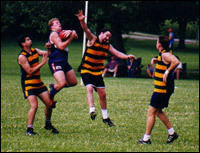 The Dockers are members of the United States Australian Football League which started in Cincinnati about 8 years ago. On any nice day I would often get outside to have a kick of the footy or to promote the game. This season I have played several games with the Dockers but have missed several practices and a road game so that I could fly. This week I knew I was ready to make my long cross-country. Despite having a home football match scheduled versus the Pittsburgh Wallabies I decided I would miss the game so I could fly the cross-country flight. When I woke up and called the Dayton Flight Service Station for a weather update, however they recommended against my Visual Flight Rules(VFR) cross-country trip due to low visibility, low cloud ceilings and pop-up thunderstorms. After planning for this trip all week I was disappointed but realized this meant I could atleast make it to my football game. But after breakfast I looked outside and the weather looked great. I waited an hour and called flight service again. They still recommended I pass on the VFR cross-country as the weather to the north was still poor. They did mention I would be safe if I stayed near my home base airport. This is when I realized my hobby priorities had shifted from Aussie Rules to aviation. Without much hesitation I decided to take advantage of the acceptable weather at Blue Ash and fly instead of playing in today's game. The flight went well. I stayed near Blue Ash for most of the flight and worked on my landings and pattern work. It was one of those days when I felt comfortable flying but did not feel confident enough in the weather to wander far from the airport. I am inching closer to completing the requirements for my pilots license with my only remaining requirement prior to the flight exam being my long cross-country. While learning to fly I have had to be very single minded and have spent much of my free time studying or spending time in the plane or at the airport. Once I complete my license I am sure flying will be my number one hobby but I look forward to being able to return to the football field to play the great sport of Aussie Rules.